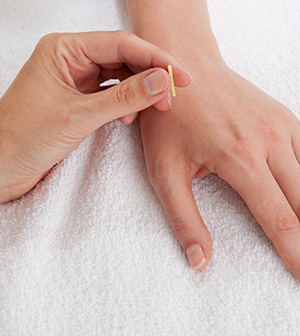 Acupuncture involves the insertion of very fine needles through the skin and tissue at specific points on the body. “Anatomical” acupuncture refers to the approach taken today by Western trained physicians in China and many parts of the western world where acupuncture points are chosen on an anatomical basis. For example, if a patient presents with shoulder pain from rotator cuff (a group of muscles and tendons surrounding the shoulder joint) tendinitis, acupuncture points would be chosen based on the muscles, tendons and nerves that are associated with the shoulder pain. “Anatomical” acupuncture differs from “traditional” acupuncture as traditional acupuncturists choose points based upon an eastern system of diagnosis that employs close observation of the patient in addition to tongue and pulse diagnosis. Illness is thought to result from an imbalance of Yin and Yang (energy in the body). It aims to balance energy and blood in a given organ system to relieve pain and treat various diseases. “Anatomical ” acupuncture focuses mostly on musculoskeletal injuries, which can complement physiotherapy manual therapy techniques. It is taught by the Acupuncture Foundation of Canada Institute (AFCI) which has been teaching western trained health professionals since 1975. The AFCI curriculum is based on the teachings of Dr Joseph Wong, a western trained physician with a Royal College specialty in Physical Medicine and Rehabilitation. He has combined his western medicine specialty with his training in traditional Chinese medicine in a unique way which forms the foundation of the AFCI training program. Decreases pain by creating an analgesic effect from release of endorphins. These endorphins which mimic morphine help block pathways that relay pain messages from the brain, along the spinal cord to the pain site. Increases range of movement due to the reduction of swelling and pain. Emotional balancing due to the release of seratonin which is an anti-depressant. Regains a normal level of homeostasis by releasing specific hormones that help regulate body temperature, blood sugars and blood pressure. Increases muscular strength and power. Research is now demonstrating that through homeostasis balancing, there is an increase in muscle strength and power. Increases energy due to the combined effect of normalizing the Autonomic nervous system, homeostasis balancing, and the analgesic effect of acupuncture. Better sleep due to the promotion of physical and emotional wellbeing as mentioned above.